(NaturalNews) In the winter of 2014, Canada's province of Ontario suffered an exponential loss of honeybees. An estimated 58 percent of the honeybee population vanished that year, frightening beekeepers. So many facets of a diverse agriculture system and healthy ecosystem depend on the bees' ability to stay healthy and pollinate. The biggest problem facing the bees all over the world right now is a class of pesticides called neonicotinoids. In Ontario, practically 100 percent of corn seeds and at least 60 percent of soybeans are treated with neonicotinoids, spanning four million acres of Ontario's agriculture. 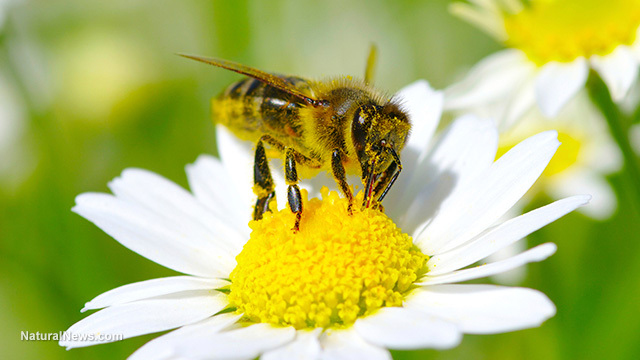 Honeybee populations are feeling the impact of the chemicals the most; neonics infiltrate pollen and ultimately disrupt and weaken the nervous systems of affected insects, including bees. "The bee yards that are near corn and soy fields are at risk of being exposed, it's highly, highly toxic so it's a big issue," says Tibor Szabo of The Ontario Beekeepers Association. Szabo, beekeepers and environmental activists have been fighting tooth and nail to stop the pervasive use of neonics. The pesticide industry, unwilling to recognize the damage their neonics cause, refuse to give in to regulations, claiming that their pesticides are safe and supported by science. CropLife, one of the powers that lobby the government for perpetual, unrestricted use of neonics, continue to advocate that neonics be used liberally as if they are some kind of sweeping insurance policy against pests. But new rules put forth by the Ontario's Ministry of the Environment and Climate Change will strictly limit use of neonicotinoids in Ontario, cautioning farmers to use the pesticides only if they can "demonstrate continued need for their use." Ontario's Minister of the Environment, Glen Murray, led the effort to oppose the pesticide lobby, and to ban the chemicals through government regulation. Farmers will now be required to undergo soil tests and specialized training to confirm that they have a pest problem and that they are qualified to use neonicotinoids in a wiser, more productive manner. Murray says neonics have been "used on all corn seeds and most soy seeds whether or not the pests are there," as if the chemicals are some kind of insurance policy. This careless strategy to ensure the survival of corn and soy surely isn't ensuring the health of honeybees and the diverse agriculture they promote. When the new rules were laid out by the Ontario government, pesticide manufacturers and allied farmer's groups joined together to fight for unlimited access to neonics. "We are concerned that farmers won't have access to the tools they need to control pests because these regulations may handicap them," stated Mark Brock, chairman of the Grain Farmers of Ontario. The fight was taken all the way to Ontario's top court. The Grain Farmers of Ontario challenged Ontario's Ministry of Environment and Climate Change. Even though more than half of honeybee hives died off between 2013 and 2014, the pesticide industry was determined to bring back neonicotinoids in full force. Represented by the Grain Farmer's of Ontario, the pesticide industry contended that the new rules were of little benefit to farmers who have to face the devastating reality of crop damage caused by invasive insects. The pro-pesticide group filed for an application for a lower court interpretation of the new rules. Their motion to stay the regulation was thrown out, and the case was taken to the province's top court. However, Ontario's highest court also dismissed the appeal of the pesticide industry. In a major victory for healthier, more sustainable and diverse agriculture, Ontario's high court sided with the beekeepers and bees! Now it is time for other nations to take a closer look at what these chemicals are doing to their environment and their agricultural economy.